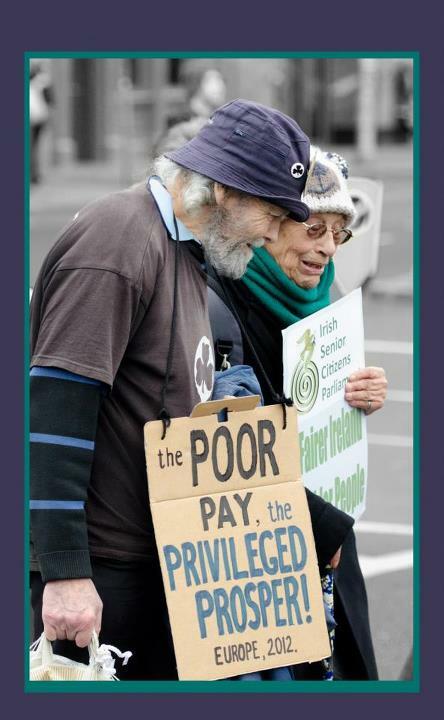 Bring your own poster or banner and remember “a picture paints a thousand words”. Remember also we are asking all our participants to dress in Shades of Grey with a sprig of Green. Queries to 01 856 1243 or email info@seniors.ie. Check our website http://www.seniors.ie and follow us on Facebook and Twitter. Wrap up well and please join us. 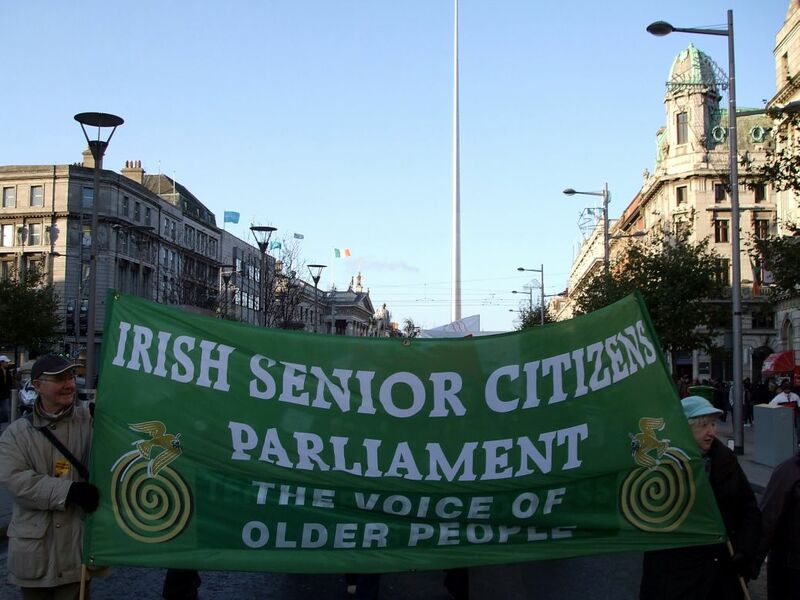 The Irish Senior Citizens Parliament (ISCP) will be taking part in the anti-austerity march & rally being organised by the Dublin Council of Trade Unions on Saturday 24 November 2012. 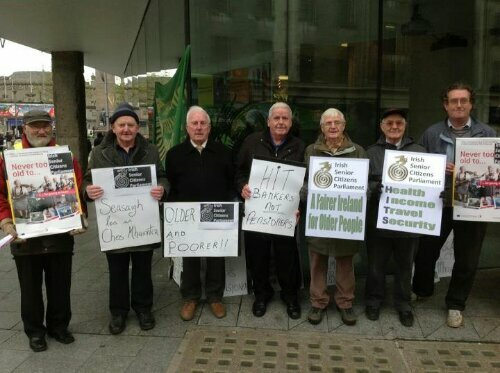 The Irish Senior Citizens Parliament supported the National Demonstration organised by the Irish Congress of Trade Unions on Saturday last. 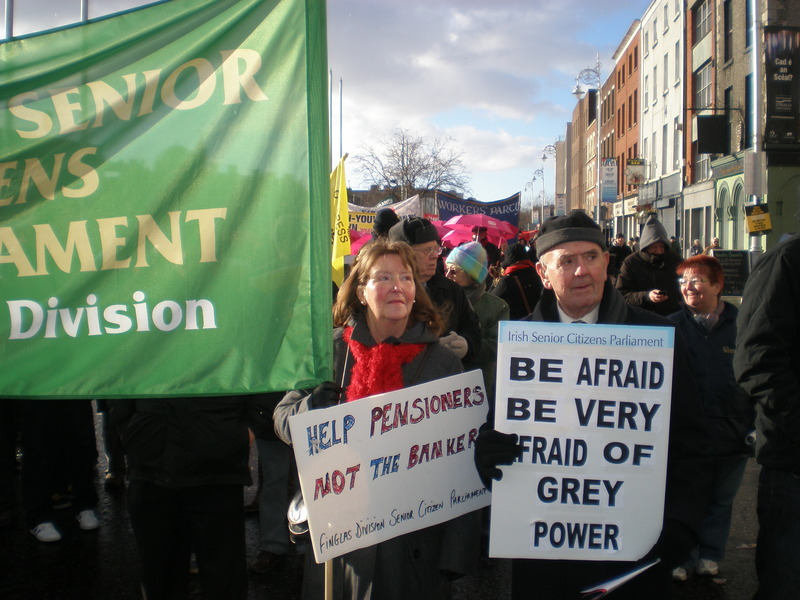 ISCP people came from as near as Finglas and as far away as Donegal on a cold, snowy Saturday to show their solidarity and to make the voice of older people heard. We joined something between 50,000 and 100,000 marchers from Dublin’s Civic Offices to the GPO. We would like to thank everybody who joined the ISCP on the demonstration. In particular our friends from Older & Bolder were prominent with their pink umbrellas. Evie Franks made a video about the Demonstration & included short interviews with the Parliament’s CEO, Máiréad Hayes, and Paul Walsh from the Parliament’s Limerick Division about why this Demonstration was so important. Addressing the crowd, master of ceremonies Fintan O’Toole said thatv “We are here to say that we are who we are – citizens of a proud and free Republican democracy”. Other speakers at the event included Ictu President Jack O’Connor, Ictu General Secretary David Begg, and Siobhán O’Donoghue of the Community Platform. Marie Doyle of the Retired Workers Committee spoke on behalf of pensioners. She said elderly people had made a huge contribution to the State during their working lives and were now being treated like parasites. “We resent being told that we are a burden for the State”. Performers Christy Moore, Frances Black and Jinx Lennon also entertained the crowd with relevant and hard hitting songs while actress, Ruth McCabe read, with emotion, from the 1916 Proclamation and the 1919 Democratic Programme the seminal founding documents of the State.